The most impressive of the handful of surviving full-block apartment buildings in the city with major garden courtyards, the Apthorp was designed by Clinton & Russell and completed in 1908, the same year as the larger Belnord, seven blocks to the north. Whereas the Belnord's much larger site gave it a larger courtyard, its north and south façade proportions are a bit overwhelming. Here, a substantially smaller site resulted in a slightly better composition. The real difference, however, is not in scale, but in style. Both are Renaissance Revival in style with rustication and large cornices, but the Apthorp, has a more lively façade because it is entirely limestone and, more importantly, because it has beautiful sculptural elements not only at its base but also near the top. 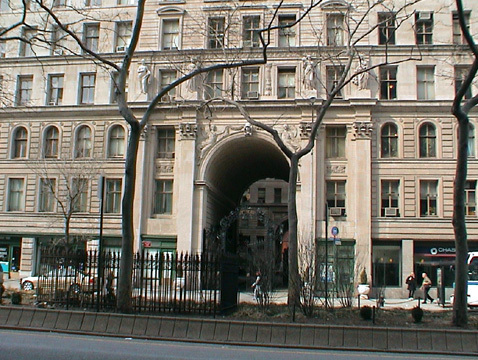 The Apthorp has two arched entrances like the Belnord but they are on different boulevards while the Belnord's are close to one another on one street. 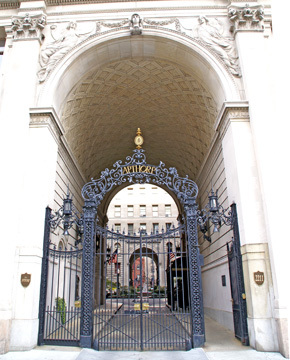 The Apthorp's arched entrances, moreover, are grander with three-story pilasters topped with sculptural figures and very elaborate and lovely iron gates and bas reliefs of draped females holding up garlands. Elsewhere on its façade are putti, which, of course, are the stamp of a good building at least for those who thought Eros was cute, if not cuddly. The Apthorp has symmetrical facades whereas the Belnord are not quite symmetrical. On the other hand, the Belnord has a level roof while the Apthorp has a rooftop pavilion and loggia. The Apthorp was built by the Astor family who also erected Astor Court, ten blocks to the north, which also has a large garden courtyard, but is not a full block building. 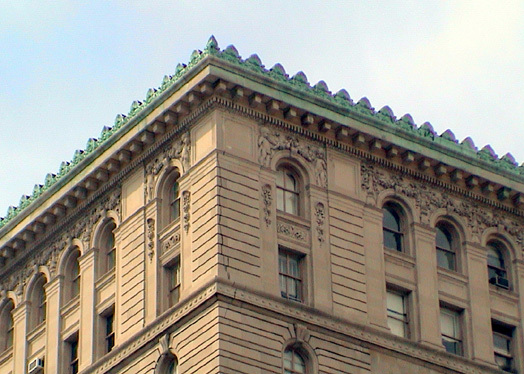 The Astor Court, however, has a much larger cornice than either the Apthorp or the Belnord. Its cornice, in fact, is one of the largest and most dramatic in the city. It was designed by Charles A. Platt in 1916 while the Belnord was designed by H. Hobart Weekes. Clinton & Russell also designed Graham Court, another courtyard building further uptown and the Langham on Central Park West, but are best known for the great Cities Service tower at 70 Pine Street, one of the city's most important and visible skyscrapers that is known now as the A.I.G. Building. Some observers have viewed such courtyards as pathetic attempts to introduce the Holy Grail, from an urban planner's viewpoint, of "light and air." They seem to think that the Roman atriums and Parisian and Venetian courtyards were refined because they were largely suffused with warm sunlight because the buildings themselves were low-rise. When exploded to the modest mid-rise height of 12 to 15 stories in New York, however, these observers have bemoaned the benefits of such courtyards, arguing that the walls are so high that the "light and air" are limited. "All of the buildings share the liability of courtyard apartment houses, which is poor light in all too many of the units, but they also share the ability of all good courtyard buildings to create far more than conventional buildings could a sense of a private, secure world." The Belnord is the largest of these and its scale is such that one must imagine that its courtyard had to be considered one of the great urban wonders in its early years just as John Portman's atrium hotels of the 1970's were the commercial bedazzlements of American architecture. In his fine book, "Luxury Apartment Houses of Manhattan, An Illustrated History," (Dover Publications Inc., 1992) Andrew Alpern noted that "The Belnord boasted the largest interior court in the world 94 feet wide by 231 feet long and an underground delivery tunnel for trucks and wagons reachable via a ramped driveway from West 87th Street. Architecturally nowhere near as successful as the Astor buildings, the Belnord, with is vast number of very large apartments, did not reach full occupancy until World War II. Since then, however, it has never had a vacancy for long, but has been embroiled for years in an acrimonious battle between its tenants and the building's elderly and eccentric owner." 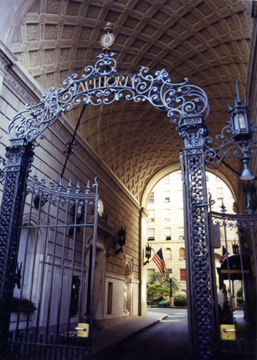 Alpern noted that the courtyard at the Apthorp "is elegantly detailed, with elaborate wrought ironwork, a pair of fountains, marble benches, statuary and greenery. The courtyard's facades are rusticated limestone and the first and second stories have arched windows and each angled corner has an entrance to apartments. In one of his other books, "New York's Fabulous Luxury Apartments with Original Floor Plans from the Dakota, River House, Olympic Tower and Other Great Buildings" (Dover Publications, Inc., 1975), Alpern noted that the Apthorp "originally contained ten apartments per floor," adding that "during the thirties and forties many of these were cut into smaller units to accommodate changing patterns of urban living." "The apartments are particularly well detailed, with each of the original suites containing a room-sized foyer with a mosaic tile floor. There are glass-paneled French doors throughout, and many of the rooms are ringed with Wedgwood-esque [sic] friezes." There is no hard-and-fast rule about such courtyards. Depending on their scale, treatment and site, they can be neighborly, invasive, inspiring, or industrial. Only a lack of imagination precludes finding exciting ways to make them inviting and sensational for they are great spaces. In their wonderful book, "The A. I. A. Guide to New York City, Third Edition," (Harcourt Brace Jovanovich, 1988), Elliot Willensky and Norval White, described the Belnord as "Brilliant, but boring." They liked the Apthorp much more: "This unusually grand, handsome, richly ornamented limestone Renaissance Revival building occupies an entire block. Probably the best of the surviving Astor apartments in New York." "William Waldorf Astor, who was called the landlord of New York despite the fact that he had lived in England since the 1890s, had been sitting on his properties for almost a generation, and his decision to build apartment houses on them now served to signal the world that the movement for development was nigh. Astor, like his forebears and other merchant millionaires who had invested heavily in New York real estate - August Belmont and the Vanderbilts and, on a smaller scale, men like Levi P. Morton and the Goelets - had a stake in the growth of the city and exerted a strong influence on its ultimate design. In turning over his lots on Broadway, which belonged to old-time New York and had not been 'improved' since colonial days, he effectively deeded the past to the future. Where a pretty two-story stone-and-frame house had stood for a century ad a half, the Apthorp Apartments rose now. Until conversion to a roadhouse and hotel in the late 1850s, the house had been the country seat of Baron John Cornelius Van Den Heuvel, the son-in-law of the prominent lawyer Chales Ward Apthrope, and sat at the southern end of Apthorpe's rolling two-hundred-acre estate. Near the site on Bloomingdale Road where Apthorpe's own mansion had commanded a view to both the North and East rivers, the twelve-story Astor Court woud eventually prevail. Astor's endorsement of the Beaux-Arts courtyard building was early and expansive. Under his auspices, the form matured impressively in less than a decaade. The Graham was eight stories tall and one hundred square feet wide, with a two-story Palladian entrance to its courtyard and a formal garden with a fountain; the Apthorp was twelve stories tall, slightly more than twice the width of the Graham, with a three-story porte corchere leading to a formal garden with two fountains. The Graham was grand; the Apthorp was triumphant. Astor of course could afford to make his investments sound by making his buildings superior if not extravagant. By the time he built the Apthorp, given his own belief in the future of the apartment house and the palpable excitement about apartments in the area, Astor felt justified in indulging himself in this creation. Money, of course, was no object, and Astor was not the frugal breed of millionaire. By then, his architects, Clinton and Russell, had acquired unuusally rich experience with multiple dwellings; after completing the Graham, they had designed the colossal Hotel Astor on Broadway between 44th and 45th, and the elegant Langham on Cental Park West. Astor focused his own personal attention on the Apthorp, offering ideas onits design gathered in his travels abroad, and then giving his architects and contractors carte blanche to building on a cost-plus basis. Inside and out, the Apthorp was an exceptional building, and it showed off the new aesthetics to advantage. Its limestone exterior was a High Renaissance composition, beautifully carved and rusticated in the tradition of Florence's Pitti Palace. The entrances were framed with garlands and reclining goddesses and spanned by delicated wrought-iron gates. The sculpture, the statuary and the overall architectural grace created a sense of place as explicit as the name spelled out in filigree in the front gates. One hundred and four families lived in the Apthorp, which made it a vast holding, the largest of its kind in the world to date. Although its apartments were very private and richly elaborated - mosaic-tiled foyers, glass-paneled French doors, a Wedgwood-like frieze in the dining room, carved marble fireplaces in the salon - its sheer size gave it a public aspect. There were hundreds of house phones or ash bins or mail chutes in the building, for example. On the top floor, there wee 150 porcelain tubs, 20 boiling tubs, and 20 steam dryes in the laundry rooms - and as many irons in the ironing room...."
The building has some decorative balconies at the corners on the fourth floor and no garage and no health club. There is a subway station at Broadway and 79th Street where there is excellent cross-town bus service on 86th Street. This neighborhood abounds in good shopping and restaurants. Riverside Park is one block to the west. In November, 2006, Mann Realty Services of which Maurice Mann is a principal, bought the Apthorp for $426 million and in March, 2007, Africa-Israel USA of which Les Leviev is a principal, entered into a 50-50-partnership for ownership of the rental building with Mann Realty Services and announced it wold invest $95 million in renovations on the property and might seek to use its 6,000 square feet of unused air rights. Mr. Mann stated that he regarded the property as an exceptional high-end rental property, but reports circulated that a conversion to condominium apartments was possible. Of the 163 then extant apartments, about 100 were rent-stabilized. 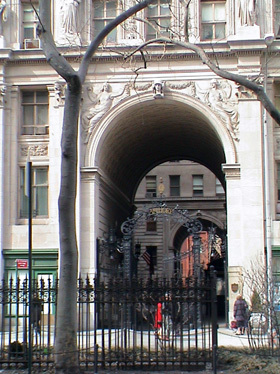 In a September 30, 2006 article in New York magazine Michael Idov wrote that the Apthorp is "Formally divided into four buildings, A through D" that loom around "a courtyard the size of a small park, with a circular, cobbestone driveway coiled inside," adding that the West End Avenue gate is "permanently closed." The article noted that tenants have included Al Pacino, Conan O'Brien, Cyndi Lauper, Rosie O'Donnell, and 60 Minutes' Steve Kroft" and Nora Ephron "who wrote about falling (and then out of) love with the building last year in The New Yorker. "To date, only 40 of the units have gone market rate; 79 are stabilized..., and 17 are rent-controlled," according to Mr. Idov, who added that 27 were vacant. "as late as July, Mann and Leviev neither confirmed nor denied the condo rumors," the article continued, add that "the building's market-rate renters saw their rents rise by jaw-dropping sums all across the price spectrum....The monthly rate for one five-bedroom went overnight from $24,000 to $35,000....On August 28, all tenants were told to report to the building's famed front gate to receive their copy of the so-called red herring: an offering plan for a condo conversion....Less than an hour later..., Apthorp employees began knocking on doors and repossessing the tomes. By the time the tenants got letters instructing them to pick up their copies at the post office instead, people, one renter says, were spooked into thinking it was a ploy to service eviction notices. The conversion plan turned out to be a 'non-eviction' one....The rent-controlled 2J...is a 3,368-square foot four-bedroom priced at $8,450,000; right now, it rents for less than $1,000 a month....The combined purchase price of the building's 163 residential units is $893,511,750....No one is more spooked than Nancy Robbins is. A theater veteran who was an extra in the Grease movie, she has, for the last 33 years, made her home in the Apthorp's 720-square-foot Penthouse 1, with her husband, Michel Dumerchat. (In the upside-down world of the Apthorp, the 'penthouses' are the smallest, dingiest units; back when each floor had only ten apartments, they were used as servants' quarters.)" The building has elevator persons and a garage. It was designed in 1908 by Clinton & Russell, who were the architects also of the Astor and Graham Court apartment buildings and the Cities Service skyscraper at 70 Pine Street. In their excellent book, "The A.I.A. Guide to New York City, Fourth Edition," (Three Rivers Press, 2000), Norval White and Elliot Willensky wrote that "monumental and magnificent, this richly ornamented limestone Renaissance Revival building occupies an entire block," adding that "the individual entrances are reached through high vaulted tunnels and a large interior court in its center." The double-height-entrance vaults have very handsome cast-iron gates and the façade is richly decorated with putti beneath the cornice. It is across 79th Street from the First Baptist Church that was designed by George Keister in 1894 whose eclectic style was designed by White and Willensky as "overexuberant Italian Romanesque (Broadway division)?" There is a subway station at Broadway and 79th Street. Riverside Drive is nearby as is Zabar's. There is excellent local shopping. The free-standing, 12-story building has 163 rental apartments, no balconies, a rusticated limestone base, protruding air-conditioners and no health club. In an interview March 8, 2007 with Bloomberg News, Mr. Mann said "this building is a big, beautiful, expensive, high-end rental and that's what we intend to keep it." A two-paragraph article at the bottom of page A15 in that day's edition of The Wall Street Journal, however, reported it "will be converted to condominiums." An article by Shira Horesh in that day's edition of Globes Online, Israel's Business Arena, that the Apthorp has 163 apartments, of which 100 are rent-controlled" and "up to 6,000 sq. m. in unused building rights." It said that Africa-Israel "intends to renovate the building" and "obtain building permits to expand the building in line with its unused building rights," adding that "the company plans to invest $95 million in the renovations, which it expects will take five years, including the sale of the apartments." The article said the "deal is expected to be closed within days." John Herbitter of Mann Realty Services told CityRealty.com March 8, 2007 that an application to the Landmarks Preservation Commission about the unused air rights "is in planning." He declined to comment on what the 50 percent partnership will cost Africa-Israel and also indicated that plans to convert the building to a condominium were not accurate. The plans to convert the building to condominium apartments, however, did proceed but in December 2008 the partnership between Mann Realty and Africa Israel ran into difficulties. According to a December 24, 2008 article by Christina S. M. Lewis in The Wall Street Journal Lev Leviev, the head of Africa Israel Investments Ltd., filed an emergency injuction in mid-December to "wrest control" of the condominium conversion of the Apthorp apartment house on Broadway between 71st and 72nd Street from its managing partner and 50 percent owner, Maurice Mann, owner of Mann Realty. The article maintained that the conversion "is in danger of defaulting, and only one unit has sold in the six months since the $1 billion project was announced, according to court documents and interviews with people familiar with the project." The court douments filed by Mr. Leviev's company charged that Mr. Mann has "run amok as manager" and spent "operations money on his personal legal fees" and allowed "employees in live in the Apthorp's vacant apartments." The article said that Theodore Steingut, Mr. Mann's attorney, said he had not seen the injunction papers but maintained that "sniping" from Africa Israel "had made the project's management more difficult, and that many of Africa Israel's claims are in error." In March 2007, Mr. Leviev and Mann Realty bought the Apthorp, which was erected in 1908 and has 163 apartments, in March, 2007 for $426 million. The Apthorp, which has a large courtyard and an impressive, gated entrance on Broadway, was designed by Clinton & Russell and occupies the full block between Broadway and Amsterdam Avenue and 78th & 79th Streets and is considered one of the finest residential buildings on the Upper West Side. According to the article, the conversion proceeded with Mr. Mann as the managing partner and "Anglo Irish Bank Corp. provided a $385 million loan and Apollo Real Estate Advisors LP gave a $135 million mezzanine loan to purchase, renovate and market the development." "Last summer, the developers began offering condos at nearly $3,000 a square foot, placing the building's sell-out value at approximately $1 billion. But as the real-estate market plummeted, Apollo began objecting to the project's budget, saying its business plan no longer made sense because of falling prices and cost overruns. In August, Apollo made a capital call of $12 million to bring its loan back in balance. It was paid. In the first week of December, Apollo made another $22.7 million capital call. Apthorp's management, controlled by Mr. Mann, responded with a $500 million lawsuit, claiming the repayment request was an improper "ransom" payment and accusing Apollo of trying to take over the Apthorp at a bargain price. Mr. Mann quickly dropped the suit, but it infuriated Mr. Leviev, who moved to oust Mann Realty as manager," the article continued. The article also noted that the former headquarters building of The New York Times at 229 West 43rd Street, which had been acquired last year by Mr. Leviev, an Israeli diamond merchant, remains "largely unleased even though the building's renovation is complete." "Africa Israel shares have fallen more than 80% in the past year," the article said, "and plummeted 20% in the past month alone, to $4.25 Tuesday on the Tel Aviv Stock Exchange. In the fall, Africa Israel announced a $475 million third-quarter loss because of falling real-estate values, mainly in Russia, and sold several of its New York assets to pay down debt. These included half its stake in the Times building, which an unnamed investor is buying for $50 million plus an assumption of half the building's $720 million debt. Mr. Leviev paid $525 million for the 780,000-square-foot landmarked building in 2007, triple what The New York Times Co. had sold it for just three years earlier. The 16-story building recently completed a $200 million renovation, according to a person briefed on the project. All floors are listed as available on its Web site, and some Midtown Manhattan office-leasing brokers said they hadn't heard of any deals. The Times building's leasing agents at CB Richard Ellis declined to comment." The Apthorp was built by the Astor family who also erected Astor Court, ten blocks to the north, which also has a large garden courtyard, but is not a full block building. 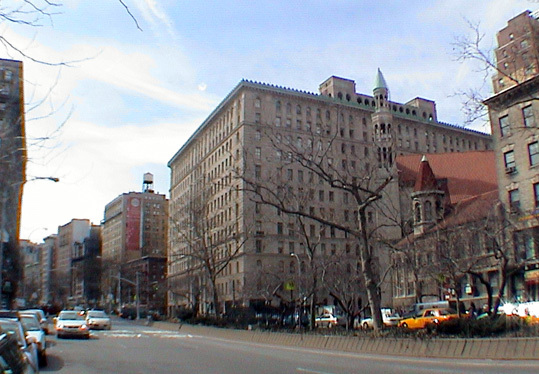 The sponsor of the planned residential condominium conversion of the Apthorp apartment building on Broadway between 78th and 79th Streets in early July 2009 lowered the prices on 32 units and launched a $30 million capital improvement program that will create a gatehouse at its large arched entrance on West End Avenue. The price reductions were announced by Broadway Management of Apthorp LLC, an affiliate of The Feil Organization. Howard Lorber, the chairman of Prudential Douglas Elliman, which is marketing the apartments, said in the press release that "This is a once-in-a-lifetime opportunity to own a part of New York's history at below market prices that will never be seen again - once we reach our conversion goal in September, prices will most certainly go up." The building, which occupies a full block and has a large and impressive center courtyard has 163 apartments and at least 15 percent of them must be sold for the plan to be declared "effective" and the deadline is in September. Buyers may choose among different high-end kitchen and bathroom finishes. Kitchens have Sub Zero, Miele, and Wolf appliances and bathrooms have various natural stones such as Calacatta Gold, Nero Marquina and White Carrara marble. For a limited time, buyers also have the option to purchase a home 'as is' or partly renovated. Building amenities will comprise a fully renovated garage with valet service, storage space, a children's play room, a central laundry room, gym, sauna and massage rooms, and a conference meeting room. Staff will include the valet, a gatekeeper, and 24-hour doorman. Improvements to the common areas of The Apthorp include restoration work being done on the public foyers, lobbies and elevators. All original stone and marble floors, plaster ceilings and wall decor will be restored as well as the courtyard's cobblestones, fountains and benches. Architects Ingrid Birkhofer and Fernando Papale of BP Architects are in charge of the restorations. The Apthorp, which is a city landmark, was the world's largest residential building when it was built in 1908 by William Waldorf Astor. His architects Clinton & Russell modeled The Apthorp after the Pitti Palace in Florence in the Italian Renaissance style. A 1,031-square-foot apartment on the seventh-floor, one of the least expensive units, has had its price reduced about $420,000 to $1,575,000. An August 13, 2010 article at therealdeal.com by David Jones, Sarabeth Sanders and Amy Tennery had the headline "Apthorp lender diverts rents from landlord." 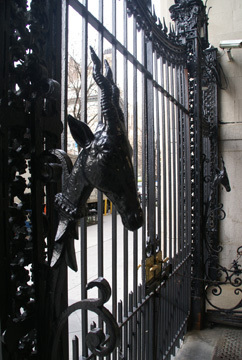 "Following the start of closings at the Apthorp, tenants at the Upper West Side condominium conversion have been told to send rent payments to a new address controlled by Anglo Irish Bank, suggesting there could be more financial trouble looming at the building, according to legal sources and documents obtained by The Real Deal,' the article said, adding that "Attorney Stuart Saft, who represents co-owners Broadwall and Lev Leviev of Africa Israel Investments, said the lender invoked a 'lockbox' provision, under a 2009 deal to extend terms of the building's mortgage loan. The article then noted that "Ben Thypin, senior market analyst at Real Capital Analytics, said lenders generally invoke lockbox provisions in troubled loan situations." It quoted Mr. Thypin as stating that "They don't want the borrower taking money out of the property that might be needed to service the debt later." "The rent payment switcheroo," the article continued, "comes weeks after the Apthorp began closing units at prices that surprised tenants and brokers, as they were drastically below those originally listed. For example, apartment 3B, a 2,350-square-foot, two-bedroom unit that was once listed for $6.6 million, finally closed earlier this month for $2.86 million, or 57 percent off its initial asking price, city records show. According to documents obtained by The Real Deal from sources involved with the conversion, 3B sold to a non-tenant, as did at least three other apartments that sold for more than 70 percent off of the asking prices published in the Apthorp's initial offering plan in 2008." The article said that "Tony Smith, president of the Apthorp Tenants Association, said most residents didn't know of the fire sale prices." "Brokers contacted by The Real Deal said they, too, were taken aback by the closing prices and had not been previously aware that such deals were available. 'Believe me, any of us wish we would've known and gotten in there," one broker said, referring to a 405-square-foot penthouse studio that sold for just $123,717 - 86 percent off its price in the 2008 offering plan - and to a one-bedroom penthouse that sold for $417,177, or an 84 percent discount. Those two penthouse units, both of which had been empty and went to non-tenant purchasers, were "in totally deplorable condition" and were therefore special exceptions, Saft explained; however, several brokers said that even for a fixer-upper, those prices, in that location, still seem low," the article said. Maurice Mann of Mann Realty is also an investor in the project.